Congratulations, Tim Beylemans! Your website, Tim's Spider Corner, has qualified for the iCandy Mediaworks Gold Fortune Cookie Award. 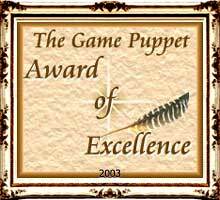 This is a very difficult award to win, so you can be very proud of your achievement. Our judges found your site to be quite informative, as well as entertaining, if a bit creepy at times ;–) It is obvious that you have devoted much time, effort, and care to the design and maintenance of your site. Thank you for making the WWW a better place! A lot of great information available to people wanting to study, or even acquire spiders for pets. I was very impressed with the amount of detail you give about the subject. And quite equally impressed with your personal collection. We have visited your site and you have won the SMHAI Excellent Award. Tim's Spider corner received 106 points. Great site but dark...the buttons were sometimes hard to see because of the dark background. Pictures good. Content excellent and well organized. Links worked independently and did not disrupt the flow of the original web page. Thank you for sharing your wealth of knowledge about spiders with the Internet world. 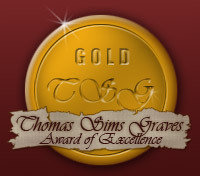 It gives us great pleasure to offer you our Gold Award of Excellence. Your site was excellent in all areas of Design, Content, Technical Criteria and Overall Impressions. I am very pleased to inform you that your website has been chosen to receive the Soaring Above the Others Website Award. It was an honor to visit & evaluate your website. It's clear that you work very hard on both your website as well as it's content. Not only is your site a thing of beauty & easy to navigate, but I learned a great deal about and developed a new respect for spiders. Thank you for providing the Internet community around the world with such a wonderful website to visit. Thank you for the invitation to visit your website. I enjoyed my time looking through your creation. The theme, background, navigation, and purpose are excellent. Your design clearly reflects high quality in content and visual elements. I really enjoyed looking through your spider collection and learning more about them. It is obvious that you are very knowledgeable on your subject matter and the information you provide is a valuable treasure. I appreciate the many hours of dedication in presenting an outstanding website like yours. It is an honor to present you with the AJCF Gold Award. I wish you continued success. It is with great pride that we announce that your web site is a winner of our RunWebAwards Program : Silver Award. We are pleased to award your website our VSDA Gold Award for an excellent and well done website. Beautiful site, even for such a creepy crawly subject. The author has a lot of respect for his subject and has presented spiders in a unique way. If only he had an article on how to overcome a fear of spiders! Great site, with nice graphics, layout, design, navigation and appearance. You have a very good award program and we wish you all the best with it. Great site, I love it and have seen it before; all I can say is excellent. This is high praise indeed from a group of professional web design people and evaluators. Dear Tim, already the first impressions of your spider sides have contributed with me to work off certain "fears of contact". Yes the contents of your web presence are really impressed to this to dismantle common prejudices opposite an often unrecognized species of animal. Your sides are simultaneous extremely extensively and very informatively. Technical knowledge founded by the arrangement stuffed itself up to the. Everybody finds you with interested valuable notes and tips. Thanks to good structuring and navigation nothing remains secret to the seeker. Coloration holding back the design through one convincedly pleasantly. I am pleased in respectful appreciation of this performance, you today think to be allowed to award graphic web design gold Award. Furthermore I wish you high numbers of visitors and much success with your web projects! We have finished reviewing your site, Tim's Spider Corner. You have a great site. You have a lot of informative useful information and your site was easy to navigate. I just came from checking your site and I am sending you my award. Thank you for your request for one of our Awards. After reviewing your site we have decided to award your site our Gold Award, nice site keep up the good work.Your Award listing can be found on page one of our winners list. You have bin awarded 80 points for you excellent site, well done on your hard work and making the web a better place, this will give you my design award.